Please print out the above link and circulate in your school. You can email more@morecaucus.org to arrange for pick up and/or drop off. Petitions can also be picked up/droped off at any of our upcoming happy hours (dates/locations to follow), general meetings (9/21,10/19) and/or our brunch(10/5). We will have MORE members collecting/distributing at the 9/12 UFT chapter leader’s meeting at the Brooklyn Marriott and 10/9 Delegate Assembly at 52 Broadway in NYC. Please have in by 11/13. Please share this link on your social media. Please sign only once (either hard copy or online). 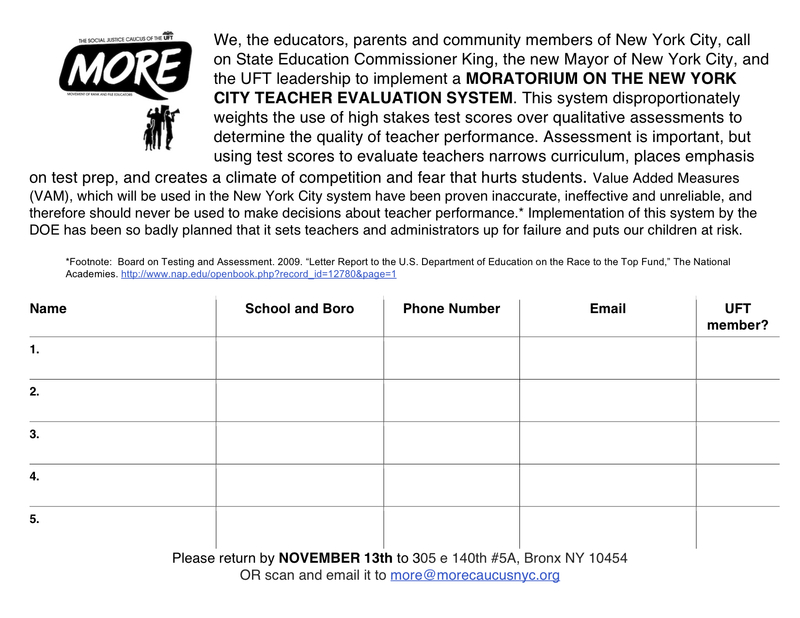 The union delegates that represent the NYC principals, ap’s, and supervisors all advised their members at the end of Tuesday’s staff development meetings to write letters in protest to the DOE on the insanity of the new evaluations. If the teachers AND their school administrators both have major problems with the evals’ , now is the time to organize a walkout or at least a “teach to the contract” action.